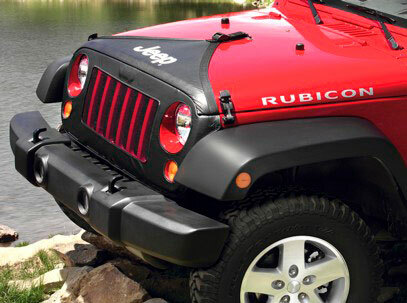 Protect the hood and grill of your Jeep Wrangler from insects, dirt, road debris and anything else that might come along to mar your ride's finish. This front end grill and hood cover made by Mopar is made of black vinyl with a 22-ounce polyester backing so it won't harm your paint and it is sized to fit your Wrangler snugly for optimal protection. The two-piece design means you can still open the hood without having to remove the cover. The Jeep logo is featured on the hood portion of the cover. Easy to put on and take off. Not recommended to leave on while raining so I do take it off and at the car wash, duh! ProsLooks good! Really protects front guard from bugs! ConsMakes popping snapping sound on freeway it looks like its about to pop off so I slow down. I did notice some marks on the hood under the area where it "snaps" I get it professionally detailed so its not that visible after buffing.